Brushed silver finish to complement any environment. 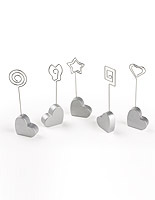 Each set includes 3 different base designs; cone, cube, and heart shape. 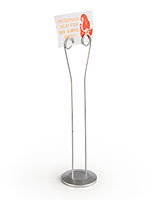 Features a strong alligator clip and scrolly sign holder to hold materials in place. 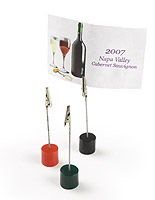 This memo display, clip photo holder is a great tabletop advertising tool. 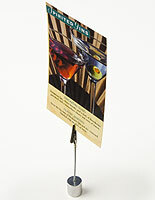 Use this menu card display to promote food and beverage specials in a restaurant. 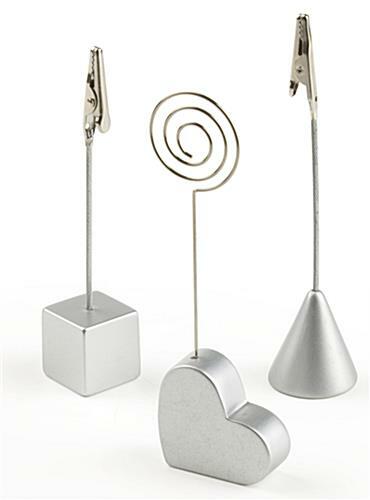 Featuring various base shapes, this clip photo holder will surely attract the attention of passersby. Each set includes twenty of each of the different note clips. With a brushed silver poly-resin base, this clip photo holder can easily blend with any table setting. Use this place card stand at a corporate function to designate seating for special guests, or to hold the table number cards. Each clip photo holder, such as a memo clip or note display, is sold in set of three different plastic base shapes; cone, cube and heart. The top portion of each sign display is either an alligator clip or a round-shaped coil to securely hold materials in place. This clip photo holder adds an element of fun to any table setting. Guests will appreciate the gesture of taking the place card display home as a keepsake. Use this clip photo holder to post important notes in an office or to display favorite pictures in a cubicle. The silver coloring is neutral; allowing it to blend with any type of surrounding fixtures. 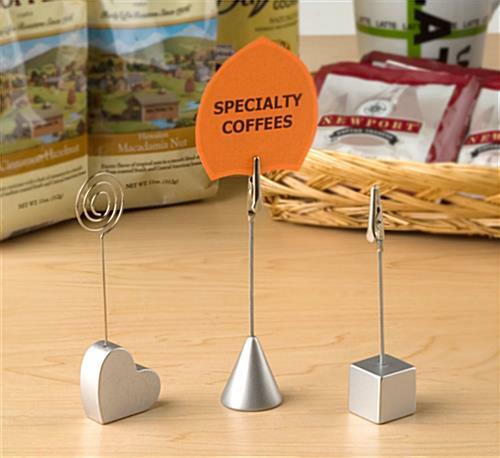 This clip photo holder can also be used to announce special sale items in a boutique or small specialty store. 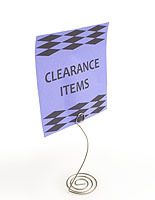 Order this memo display in bulk to receive the lower price points. 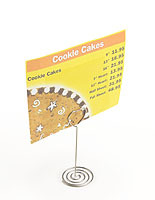 This clip photo holder is also perfect for use in restaurants, banquets, retail stores, offices and even homes! Please Note: When ordering, 1 unit = 60 clip photo holders (20 of each shape).